”Prefix” © Carla Garlaschi,Alejandro Contreras, 2008. PREFIX: a dialogue between two walkers. Is in deed this will of the walker the one that take us for different ways to live in this northern city. Unsettled political times, ideological struggles, tacked dreams of founding Mount Parnassus and images that are unachievable in the TV and libraries. Is ours, the relation between the things founded, idealized and remembered, so as the things we newly start willing. We go reading between lines, watching how in the market the Garcia Marquez’s Innocent Eréndira and heartless grandmother buying the onions from Neruda’s poems while we sing “Brev från Kolonien”, but we just bend down to pick up a paper that fell to the floor and when we stand again the old woman has vanish, and for the smell we knew that a huge wave took her away… Days after, a suitcase came back with the current… what was in is our next exhibition PREFIX. Studies art in the Universidad Católica de Chile (2002-2005) Participates in different exhibitions in Santiago, one of them ”Capriccio” placed in the Chilean Ministry of Interior . At 2006 won the first price of the XXVI version of the International Contest of Painting ”Valdivia y su Río” with these began an itinerary exhibition by the cities of Puerto Montt, Río Bueno, Chillán, Los Angeles, Arauco, Concepción and Valdivia, all of them at the southern side of Chile. During 2006 works in her studio situated in an old seigniorial house in the storic centre on Palma de Mallorca where she makes several private openings. June 2007 makes a solo exhibition in Studio 14 Galleri in Stockholm, Sweden. Lives is Stockholm since then. Lives in Sweden from 1979. 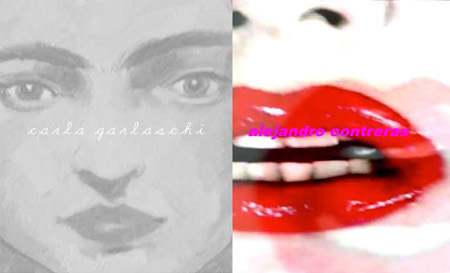 Multimedia artist, has realized exhibitions of video art, cinema, installation, electronic music and performance in northern cities like Stockholm, Gothenburg, Harnhem, New York, Vigo in Spain and Finland as also in South American cities like Montevideo, Buenos Aires, participating frequently in video art festivals. Also produces radio and TV programs related with art and culture.